The Manchester Museum contains an intriguing object numbered 296. At 38cm long and 7.8cm in diameter, at first sight it looks like a thin pottery vessel, open at one end and with a small hole at the other. Were it not for the chance discovery of a dead bee inside (and traces of pollen), the function of this object may have gone unrecognised as an ancient Egyptian beehive. The ancient Egyptians were extremely fond of honey, which they used to sweeten cakes and beer. 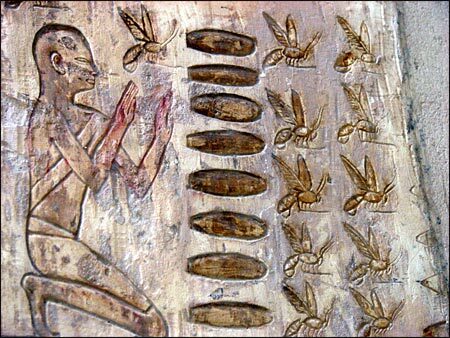 Beekeeping is most famously depicted in the Theban tomb of Pabasa (TT279), an official during the 26th Dynasty (c. 650 BC). The practice of using large numbers of pottery cylinders of roughly the same design continues today. Acc. no. 296 is a fine example of an object that attests a practice that we know must have taken place, but which is only hinted at in textual sources or fleetingly represented in tomb scenes. Perhaps unsurprisingly, it originates from Petrie’s excavations at the Middle Kingdom town of Kahun, which has furnished us with so much detail about life in ancient Egypt. Colleagues at the ManchesterMuseum, Whitworth Art Gallery and Manchester Art Gallery have recently participated in a training course to learn the ancient art of beekeeping. A nasty mite called Varroa has wiped out large numbers of bee colonies in the UK, leading to calls for action to ‘save the bees’. Learning beekeeping is one very important contribution to sustain bee populations, which are vital for the pollination of plants – and therefore the production of crops. It is hoped that the Museum will soon have its own beehive, with honey to sell in our shop. Who knows, we may soon also be producing ancient Egyptian sweets! There are published, securely excavated Egyptian-style beehives from Tel Rehov in Israel. However, those are significantly larger: 80 cm long, and 44 cm in diameter. They are made of unbaked clay, and are part of a large installation of over 100 stacked hives. There’s an initial publication in Antiquity (2008: 629-639) about the first 8 that were found, but I believe they are up to over 100 now. It’s very interesting that the one from the Manchester museum is fired clay, and is so much smaller! Would one really be able to remove honey combs form such a small container? Perhaps this smaller container was used to establish a small colony/comb, which could then be transported, instead of for actual honey production? Bees are being wiped out across the planet – this is not an issue which is only effecting England. The cause is unknown, but very likely the new breed of pesticides which are nicotine based, and are extremely popular, are the cause. We are the Royal decendants of Pharoah Akhenaten-Moses 1440BC from King Gaedhealh in Ireland Moses’s grandson our ancestor and a beekeeper in Victoria,Australia. So that beekeeping is in our ancient blood from Egyptian days heay? Prince Andrew and a beekeeper by occupation since 1972! We like this page and your Museum in Manchester for showing the Public these interesting facts about early Egyptian life which was agricultural based along the Nile River where bees were used to pollenate crops and obtain honey as a food source of the early Egyptians! Thank you! I do not think that cylinder was used for an entire hive. How do the archaeologists think it was used? I agree with GirlArchaeologist – I think it may be more likely it was to transfer a queen bee from an old hive to a new one in order to increase or move the colony. I have a friend with a “wild” honey bee colony in a tree in her yard, and I was thinking recently about how to transfer the bees to a modern “super” in order to harvest the honey without sacrificing the tree. Something like this clay container would serve well. 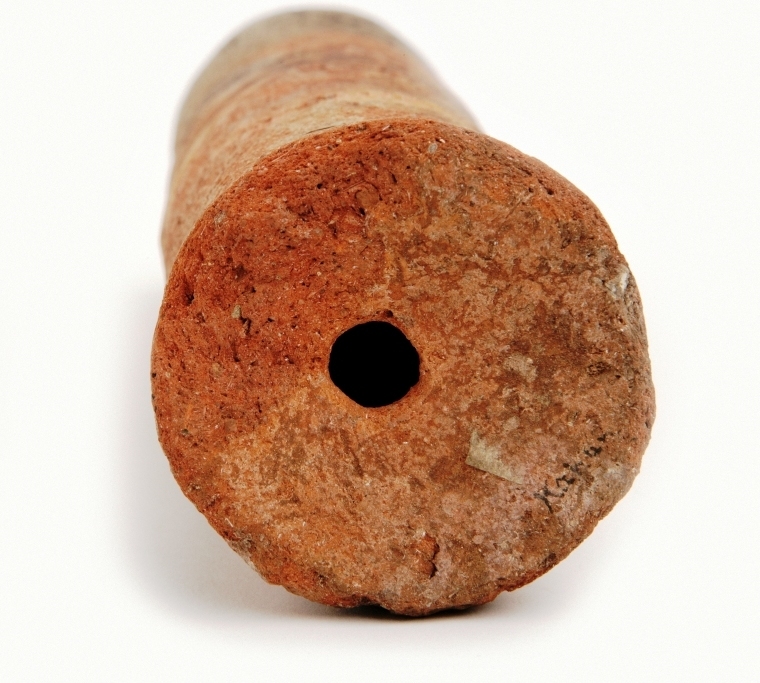 Perhaps that’s why this cylinder was fired – it was not intended to be broken to remove honey,, as the larger hives GirlArchaeologist mentions were made of unfired clay. Bees are dying today due to pesticides and GMO’s. What is it made of? What materials?